A buggy system with a poor customer service. 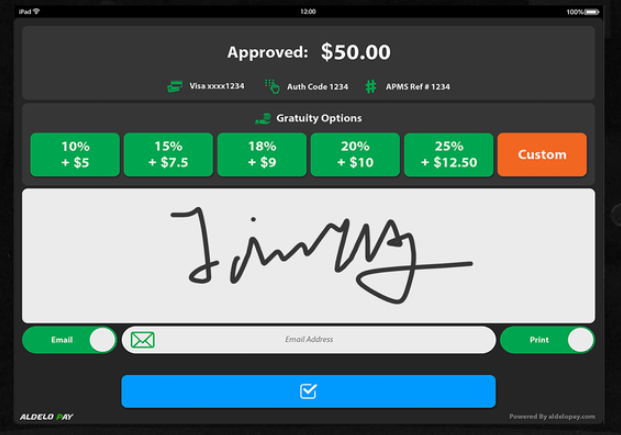 We’ll give it to you straight: You’ll likely want to pass on Aldelo as a POS service. While it does offer a reasonable range of features and abilities, the system’s interface and backend tend to malfunction frequently, it’s costly, and the customer service team has been reported to offer poor response times and inadequate help. 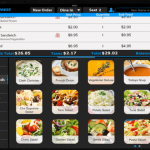 If you’re looking for a restaurant POS service, you might find our TouchBistro review more rewarding, as the software offers better features and 24/7 service at a fair price. Or, if you’re a retailer in need of a POS, you can’t go wrong with our comparison of the top ten retail POS services. 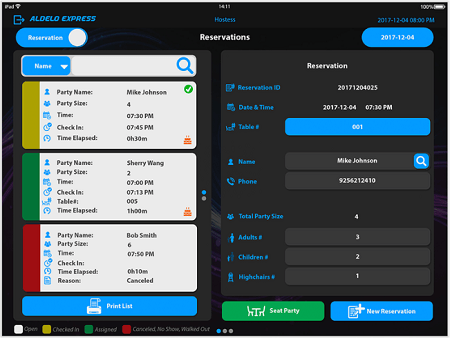 Aldelo’s main POS offering is the Aldelo Express POS, a cloud-based iPad app most useful for table service and quick-serve restaurants, though it can be used for retail stores as well. It is billed as a free downloadable service, and it is – with one catch. If you want to use the free version, you’ll need to use Aldelo Pay, a merchant service that charges you a percentage of each sale made through the POS. If you skip Aldelo Pay, your only option is to pay $99 per month per device, with a device access limit preventing you from adding additional iPads. 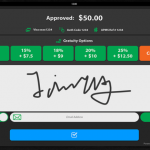 The Aldelo Express POS is available on desktop as well as mobile. Users can use their existing POS hardware, provided it meets Aldelo’s system requirements. Our review covers the main features that Aldelo POS has to offer, before going on to address what to expect from the technical support options available along with more background details on Aldelo’s price plans. The features aren’t the issue when it comes to the Aldelo POS: It’s the software that is supposed to make the features work. Various users have reported a “slow” response time due to software that crashes “a lot” and may qualify as “incomplete.” With that grain of salt, here are the (honestly, pretty comprehensive) features that you can expect from the software. The interface supports visual floor plans and table management, all with a blocky interface and plenty of primary colors. Additional restaurant features include guest reservations, wait lists, bill splitting, discounts, surcharges and gratuity. 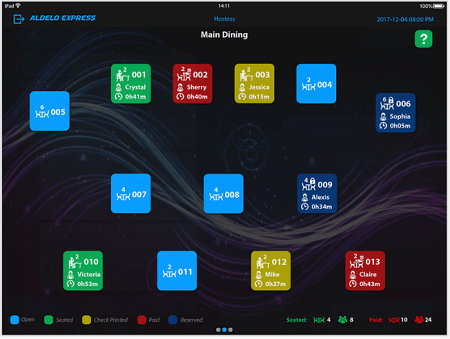 Aldelo Express also supports delivery service operations, which not all restaurant POS services do. It offers an integration with Caller ID and includes a feature that enables driver dispatches from the app. ​A built-in time clock measures when employees check in and check out of their shifts, ensuring managers can track their hours, and a scheduling feature lets managers prepare a shift schedule to plan for the weeks ahead. The Aldelo Express POS functions offline, allowing you to keep your business in operation even during quick power outages or if someone trips over your internet router. It’s an essential POS functionality for any serious business, and Aldelo delivers. 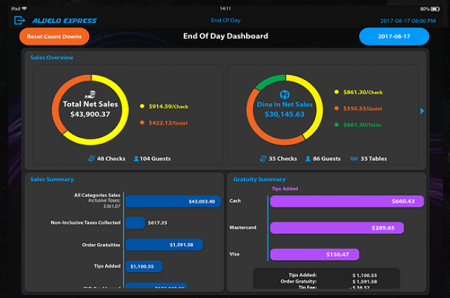 Aldelo’s End of Day dashboard offers sales overviews that tell managers at a glance what their total net sales were, breaking down the results by checks, guests, and tables. It can also break out the taxes, gratuities, and additional tips earned during a set period. Inventory and Recipe tracking are listed as “Coming soon in 2019,” on Aldelo’s website, along with store transfers and serialized tracking. Of these, inventory tracking is the most useful, as it lets managers know when to restock certain items ahead of time, making sure they never run out. It’s a pretty common POS feature, and one of the few more basic options that Aldelo doesn’t offer. Here’s a quick tutorial that gives you a look at the Aldelo Express iPad app in action. 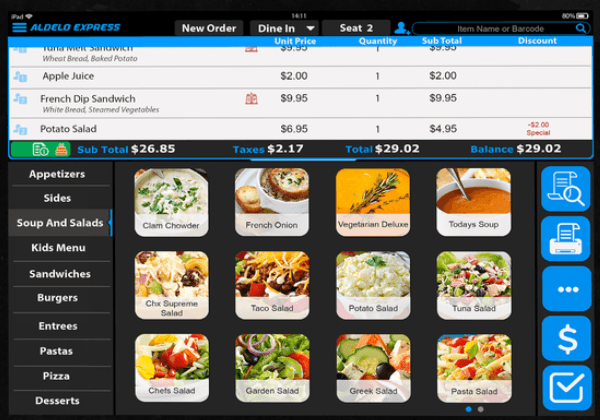 The interface’s wide ticket area and meals buttons are visible, giving servers the data they need to place orders with a minimum of finger taps, all from an iPad. Aldelo’s support options include a phone line and an email, both of which are available for response 24/7 according to their website. According to a number of user complaints, however, the support isn’t as responsive or helpful as advertised. In addition, Aldelo offers a number of Software User Manuals available for free download from their website, as well as video tutorials for the POS and for set-up, which by all reports seems to be a pretty painless process. The Aldelo Express POS can be downloaded and used for free only if you use Aldelo Pay Merchant Services, which charges you a set percentage of each sale you make using the software. However, this “free” version does include unlimited users and devices. If you don’t want to use its merchant services, Aldelo will charge you $99 per month per device to use Aldelo Express. That’s a pretty pricey starting point: For comparison, industry leaders like Touchbistro and Square start at $69/month and $60/month, respectively. Granted, one top POS, Lightspeed, also starts at $99/month, but it comes with more to recommend it. Don’t take my word for it, though: If you’re interested in seeing for yourself how well Aldelo compares to quotes from across the POS industry, you should check out TechCo’s quotes form. It’s available at the bottom of the page, and offers a fast way to start collecting custom quotes from the best POS vendors around. Aldelo is not a recommended POS vendor. The service offers a good range of features, but can’t overcome a buggy interface or lackluster customer support when it comes to justifying its premium price tag. If Aldelo undergoes some major overhauls, we’ll update this review to let you know, but for now, you should probably pass.